Travel with Kevin and Ruth! : We think we'll stay here another day! We think we'll stay here another day! Another beautiful day. Clear blue skies and high of 28C (83F).That doesn't help the forest fire situation southeast of here, but it sure is nice for us travelers! We had originally thought about making it to Smithers yesterday because it's not that far. But we're in no rush, and we got sidetracked to a beautiful campsite! Our tires are scheduled to arrive in Smithers possibly Tuesday, but for sure on Wednesday. So we don't really have to be there until then. Yesterday's drive, 55 kms (32 miles). I'm trying a different map format for you all. You can zoom in or out to see where we are. What do you think? We have now completed the Cassiar Highway! We turned onto the Yellowhead Highway #16 and are now headed southeast towards Prince George, B.C. Bought some fuel in Kitwanga for $1.39 per liter ($4.00 USD per gallon), but only enough to get us to Prince George next weekend where the gas is currently a bargain (!) $1.28 per liter ($3.70 USD per gallon). Stopped at the visitor's center in New Hazelton. We hadn't realized there was going to be so much to see and do in this area. Lots of hiking trails, and great scenery. They told us about a nearby bridge that is worth seeing, and then the town of Old Hazelton. So we drove over that way. This bridge was built in 1931. The bridge is only 16 feet wide, yet sits 262 feet above the river below. Out for a walk on the bridge. Looking down at the Bulkley River. Traffic can only flow one direction at a time. From there, we headed another 7 kms (4 miles) to the townsite of Old Hazelton. They were actually holding their "Pioneer Days" festival yesterday, but we arrived just as things were winding down. The oldest building in town. St. Peters Anglican Church was built in 1900. We had researched several free overnight possibilities, but the girl in the tourist office suggested Anderson Flats Provincial Park. It's a kind of an oddball park in a way. They don't advertise that camping is allowed, and yet nowhere does it say that you cannot camp. There is no fee box or registration. We arrived to find perhaps 10 sites where the grass is cut and there are fire rings. Two truck campers are here, plus a tenter. It's a gorgeous spot, right by the Skeena River. Where the Bulkley River meets the Skeena River. It's looking like another beautiful day. We think we'll just hang out here and relax! I like the new map. Easy to zoom in and out to find out where you are in relation to bigger towns. Yep, Kevin is not sure why he never really looked at putting up this type of map before. A pretty nice spot indeed! I love these rustic old towns. So do we Peter, there is always some interesting history in these little towns and neat looking buildings. Looks awesome there, how are the bugs? No bugs at all. A few wasps buzzing around. Love the interactive map! Great spot! 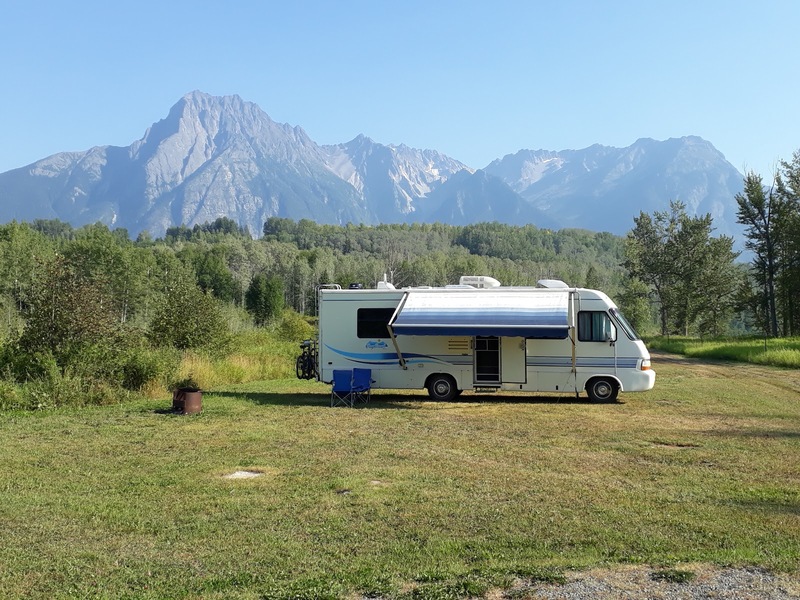 Our boondocking spot is one of our best we think. Thanks Helen. The area here is gorgeous, it's just unfortunate that we will soon be heading back into areas where there are forest fires and heavy smoke. We sure hope that the majority of British Columbia can get some much needed rain and soon! Will you be visiting Prince Rupert? Unfortunately no, we are headed in the opposite direction. Love the pictures! I lived in the Hazeltons for the first 28 years of my life. I never get tired of looking at Roche de Boule. Grand'ma Read worked in Hazelton for a while. Kevin said he didn't know that. Do you remember where it was that she had worked? We love the new map! Glad you went with it, it really helps to give a better perspective of your travels. Journey on! Thumbs up for the new map and staying another day!! Stunning scenery..captured so well in photos. Map is beaut idea..We drove uo to Carcross..thanks for posting great info. That whole area around Carcross and all the way to Skagway is beautiful. We loved it there and it's one of the places that we want to head back to on another trip someday. Nice spot Kevin. New Tires? The trip North wore them out? BTW the map feature works well. Glad you like the new map. Fantastic and I like the new map format! Love the map. It’s sure is a long distance to Mexico. Thanks Nora and yep , it is a long way down there! To think that Sherman was down at the bottom of Mexico at the end of February and then all the way up to Tuktoyaktuk at the beginning of July and is now on his slow journey back down to Mexico. Map is great! Nice you stayed an extra day to take in more sights and relax. Love the old town and especially when festivals are going on. Lovely camping spot, enjoy your stay and be safe. Glad that you like the map, it is so much better than the old one Kevin was using. No schedule for the next four weeks! A nice hike, a beach, and some rain! We didn't play tourist for very long! Well, we spent a chunk of money yesterday. Good thing we didn't meet any oncoming traffic!